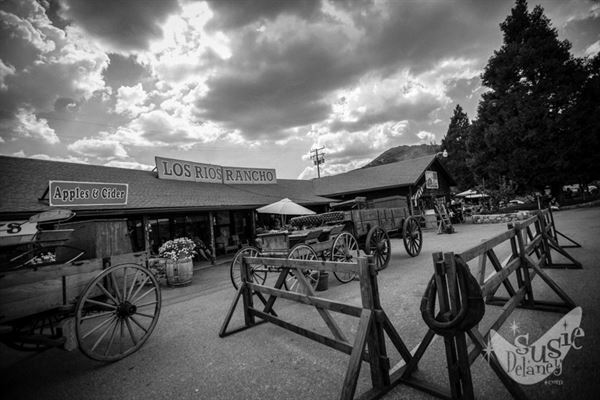 Pleasantly situated in the scenic agricultural community of Oak Glen, Los Rios Rancho is southern California’s largest Apple Farm in operation since 1906. We specialize in historic entertainment using our agricultural heritage as backdrop for our many public events and living history field trips. Let us apply our expertise to your next event, combing rustic county charm with modern comforts. The package includes: • White padded folding chairs at the ceremony Sight • Arbor. Your choice: White wood, with rounded top or Willow brush arbor • Dressing room. Available 2 hours prior to ceremony start time. • Golf Cart and driver, to transport guests from parking to ceremony seating. • Day Of Wedding Coordinator. • Antique carriage for gift placement We will provide: • Two Folding Chalk signs to assist your guest with directions • Set up and take down of ceremony chairs/arbor • Necessary staff to accommodate the event. Rental rates: Friday – starting at $1500.00 Saturday and Sunday – starting at $1600.00 Pricing for a minimum of 100 guest, $10 for each additional guest. Please review our attachment for complete package details. The package includes: • White padded folding chairs at the ceremony Sight • Dressing room. Available 2 hours prior to ceremony start time. • Golf Cart and driver, to transport guests from parking to ceremony seating. • Antique carriage for gift placement • The Apple and Carriage barn for aprox. 3 ½ hours for your reception • Wooden folding chairs • An assortment of 6’ and 8’ round tables • Your choice of our house linens • Burlap and lace table runners • Custom Floral table arrangements • Kerosene lanterns • Votive candles • Much more….!!! Hors-devours: Cheese trays, Crackers, vegetable trays, and our homemade spinach dip Drinks: Our Farm Pressed Apple Cider, lemonade, Tropical Iced tea, coffee, and water. Rental rates: Friday – starting at $5000.00 Saturday and Sunday – starting at $5200.00 Pricing for a minimum of 75 guests, $30 for each additional guest. Please review our attachment for complete package details. The package includes: • White padded folding chairs at the ceremony Sight • Dressing room. Available 2 hours prior to ceremony start time. • Golf Cart and driver, to transport guests from parking to ceremony seating. • Antique carriage for gift placement • The Apple and Carriage barn for aprox. 3 ½ hours for your reception • Wooden folding chairs • Your choice of our house linens • Custom Floral table arrangements • Kerosene lanterns • Votive candles • Much more….!!! Your choice of four of favorite meal options: • Slow roasted Tri-tip and Lemon herb chicken • Lemon Pepper Chicken • Chicken Pie and Roasted Apple Butter Glazed Ham • Portabella Mushroom Lasagna, and Red Sausage Lasagna. Rental rates: Friday – starting at $7000.00 Saturday and Sunday – starting at $7200.00 Pricing for a minimum of 75 guests, $50 for each additional guest. Please review our attachment for complete package details. Ceremony under the Oaks and Blue Sky Reception. An all outdoor event to emphasize the majestic beauty of our Glen. We provide al the luxuries accompanied with an indoor event to make it even easier for you to take your first dance under the stars.